Springfield Harness Co., 1906-1919; Springfield Coach Works, 1918-1925; Springfield, Massachusetts; 1919-1925; Chicopee Falls, Massachusetts. Rauch & Lang Inc., Rolls-Royce of America Inc.
A satellite facility located in Chicopee Falls, a northern suburb of Springfield, supplied production bodies to Stevens-Duryea, taxicab bodies to Rauch & Lang and side cars to the Hendee Mfg. Co., better known as the manufacturer of Indian bicycles and motocycles. 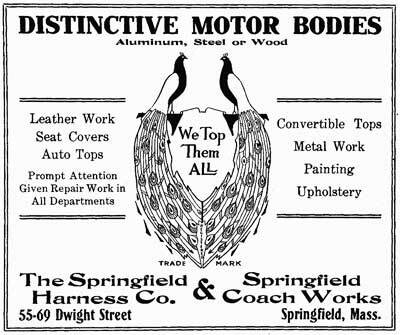 Springfield Coach Works’ direct predecessor, the Springfield Harness Co. was founded by Alphonse U. Premont, a talented Canadian machinist who emigrated to the United States in 1895. Alphonse Ulrie Premont was born in St-Bernardin Parish, Waterloo, Shefford County, Quebec , Canada on June 14, 1882 to Joseph Alfred (b.1843–d.1913) and Philomène (Boucher - b.1845–d.1890) Premont. In addition to his parents, the Premont family included the following children: Frederic Auguste (b.1864–d.1865); Lea Vitaline (b.1866–d.1867); Napolion (b.1868–d.1952); Anonyme (b.1870–d.1870); Arthur Firmin (b.1871–d.1956); Joseph Albani (b.1873–d.1945); Cora (b.1875–d.1951); Georges Zoel (b.1877–d.1945); Oscar Achille (b.1879–d.1945); Alphonse Ulrie (b.1882–d.1960) and Francois Xavier Albert (b.1884–d.1885) Premont. After Joseph Alfred Premont’s wife Philomène passed away (in 1890) he remarried Rosalie Pouline on May 3, 1897, his bride being the widow of his godfather. Four of the Premont children emigrated to Central Massachusetts to seek employment in the regions booming manufacturing business, their names being Napolion (b.1868–d.1952); Arthur Firmin (b. Feb. 17, 1871–d. Jan. 29, 1956); Georges Zoel (b.1877–d.1945); Oscar Achille (b. Jul. 8, 1879–d.1945); Alphonse Ulrie (b.1882–d.1960). Only Joseph Albani Premont (b. Jun. 25, 1873–d. Aug. 24, 1945 in Quebec) remained in Canada with his parents. Shortly after his immigration Alphonse U. Premont *settled in Chicopee Falls, Massachusetts finding employment as a machine tool foreman with the J. Stevens Arms & Tool Company and during the next few years two of brothers - Georges Zoel and Napolion (Premont) joined him at the firm. The fourth brother, Joseph Oscar Premont* (b. Jul. 8, 1879) also emigrated to Chicopee, Massachusetts, and although he may have worked at the J. Stevens Arms & Tool Company for a short period, by 1900 he had established the J.O. Premont Harness Co. at 75 Market St in Chicopee Falls. Premont, Arthur F.; harnessmakr, h 28 Randall Av. Premont, Joseph O.; (Spfd. Harness Co.) 196 Chestnut, h. 10 Wilbraham av. “This top shield, which is made of Pantasote and Fiberloid*, is attached at the base to the front part of the dash with fasteners, and is inclined rearwardly and supported at the top by a yoke shaped frame, which is hinged at the base over a plunger lock which permits windshield being pushed forward and locked in an upright position when getting in or out of car. “The yoke shaped frame, which is made of a highly polished brass tube, is demountable, corners being threaded and screwed into the brass tube, so that it is possible to convert windshield into a regular storm front at a short notice. The top shield, having no support in the center, is deflected by the pressure of the wind, and thereby automatically adjusted to the condition of speed of the car. “The shield being supported on a loose frame is not subjected to the vibration of the car, such as would be experienced with the rigid frame. It is adjustable, so that it can be raised or lowered to meet the line of vision of the driver. The shield can be removed from the car in an instant, through the loosening of two tension nuts only. 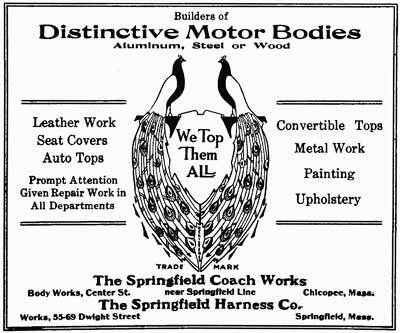 “It is the purpose of the manufacturers, the Springfield Harness Co., Springfield, Mass., to have one representative in each city and town, and they will sell the frame only, so that makers can make their own windshields successfully. Frames complete will be made standard, requiring but very little alteration to be fitted to any make of car, a feature that makes this windshield particularly desirable for commercial purposes. 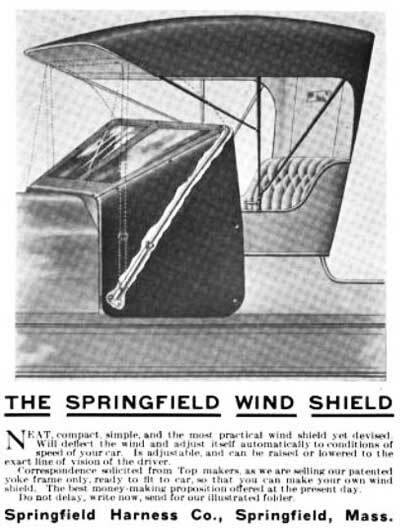 “The Springfield Harness Co. has patents pending on its yoke frame, and the inquiries already received from prominent top makers throughout the country speak volumes for the success of this new windshield. During the teens Alphonse U. Premont reorganized his brother’s harness business and relocated it a few blocks away to 55 Dwight St. Alphonse served as president and treasurer, and his brother Georges Z., vice-president. 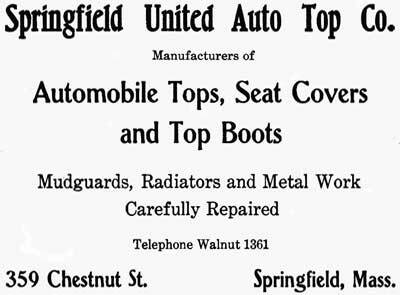 Their brother, Joseph Oscar Premont, organized a seemingly competing firm, the Springfield United Top Co., at 359 Chestnut St., Springfield, which was located down the street from his original shop and just 2 blocks away from his brothers’ business. “Springfield Coach Works, Springfield Harness Co. props. Auto tops, motor bodies and upholstering. 55-69 Dwight-see p. 36. “Premont, Alphonse U.; pres. and treas. Spfd. Harness Co., 55 Dwight, and treas. Spfd. Coach Works (439) res. 31 Elm St.
1920 also marked a significant recapitalization of the Springfield Coach Works, which was spearheaded new investors, the State of Massachusetts reports that Articles of Organization were filed on Sept 17, 1919; and the firm was incorporated on October 1, 1919 with $450,000 of authorized capital stock by A.U. Premont, M.B. Foster and William S. Fish. Steam got a few facts wrong, they incorrectly stated the firm’s address - 59 Dwight St. is in Springfield – however, they had recently acquired a plant on Center St. in Chicopee Falls near the Hendee Mfg. 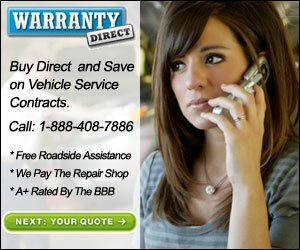 Co. A display ad seen to the right lists both addresses. Leon J. Harley Jr. (b. Jun. 1879) was the son of Flora A. and Leon J. Harley (b. Apr.1852), the Vermont-born proprietors of the Harley Company, a Springfield-based manufacturer of cast and drop-forged bronze, iron and steel specialties. Harley Sr., a long-time employee of Smith & Wesson, who left in the early 1890s to become superintendent of the Elektron Co., a Springfield manufacturer of electric elevators. The officers of the company included; W. D. Sargent, president, E. H. Cutler, treasurer, L. J. Harley, superintendent, and L. J. Harley, Jr., assistant treasurer. 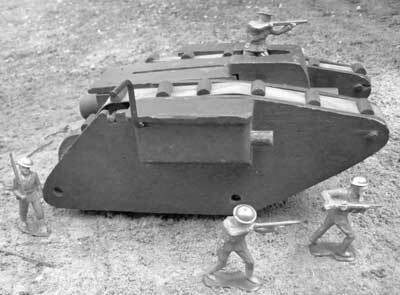 If the firm produced any automotive-related items I couldn’t find them, however they did make numerous small cast-iron and wood specialties including paperweights, casket handles, and toys. Their toy line was successful enough to have been spun off to the C.E. Bradley Corp. of Brattleboro, Vermont in 1918. “TAX FREE in Massachusetts, Connecticut, New Hampshire and Vermont. FREE of Normal FEDERAL income tax. 1 share Common with every 4 shares Preferred. “A GOING CONCERN which manufactures high-grade AUTOMOBILE BODIES and maintains a special department for the manufacture of CUSTOM BODIES. The company has large production CONTRACTS from the MERCER Motors Company, the DU PONT Motors Company and for CADILLAC, PIERCE-ARROW, PACKARD, FRANKLIN and other cars. It has $625,000 worth of contracts on hand, While contracts offered total $2,500,000. “The PLANT at Brightwood has railroad frontage and is equipped to take care of an enormous volume of orders. “PREFERENCES: Dividends are cumulative, preferential and payable quarterly. Preferred both as to Assets and Dividends. Callable at 110 and dividend on any dividend date. “The matters of PRIORITIES, PROTECTION OF ASSETS and payment of the SINKING FUND have all been provided for according to the sane principles of the most conservative financing. “Automobile manufacturers are finding it almost impossible to get bodies made as fast as they require them. In view of this pressing demand and by reason of the exceptional facilities the Springfield Coach Works possesses—both in mechanical equipment and in highly skilled personnel—the future of this company may be safely predicted as unusually big. George M. Hendee, Capitalist and Director Union Trust Co.
L. J. Harley, Jr., Director: Harley Co., Union Trust Co. and Hendee Mfg. Co.
Frank J. Weschler, Vice-President the Hendee Co.
L. J. Harley, Director: Harley Co.
Edwin Krause, Vice-President, the Hendee Co.
“This information has been obtained from sources we believe to be accurate, and though we do not guarantee them, they are the data upon which we ourselves have acted in our valuation of the securities. “We recommend this offering as a thoroughly well secured and conservative investment. 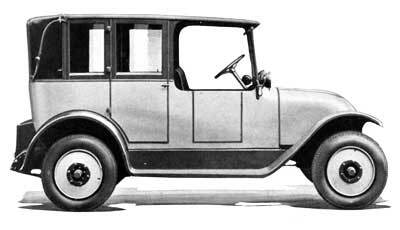 The recapitalization coincided with the production of the Springfield Silver Ghost in Rolls-Royce of America’s East Springfield, Massachusetts plant, and subsequent news articles reveal that Springfield Coach Works supplied some production bodies to the automaker. The 10 sub-contractors who supplied bodies for the Rolls-Royce Custom Coach Work program included Biddle and Smart, Brewster, Holbrook, Merrimac, New Haven Carriage Co., Smith-Springfield, Springfield Coach Works and Willoughby. Much speculation has been focused on the remaining builder, who mostly likely was the Springfield Body Corp. of Springfield, Massachusetts (not affiliated with Smith-Springfield), although the Amesbury Body Co. of Amesbury, Massachusetts is another possibility. 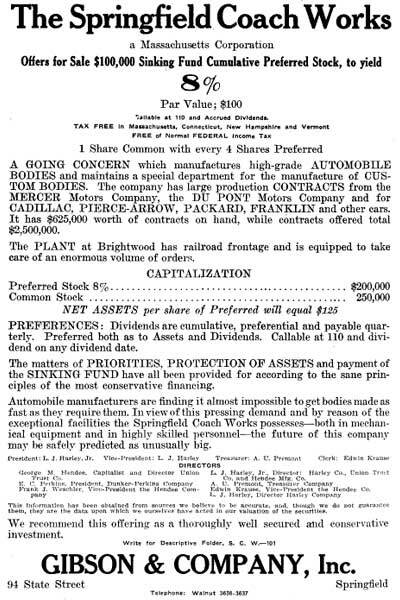 “SPRINGFIELD, MASS., Jan. 3-Production of automobile bodies has entered upon a period of expansion in this district. “The Auto Metal Body Corp., building Hupmobile bodies, plans an early enlargement of its plant. “The All-Metals Co. is negotiating for a building in which to engage in the systematic manufacture of bodies. “Springfield Coach Works has bought the land and buildings on which its factory is located, and in the near future will erect a structure specially adapted to its needs. “SPRINGFIELD, MASS., May 1— Orders are being received at such a gratifying rate at the Rolls-Royce works that it is planned to make another addition of 200 men to the plant force May 15, bringing the factory to practically normal production. The feature of the selling situation is the continued large demand for closed cars. “Springfield Coach Works has doubled its force employed in making automobile bodies, and is turning out many custom bodies for the Rolls-Royce and other makes. With its associate concern, the Springfield Harness Works, it is rushing production of Hendee sidecars. Some of the bodies being produced by Springfield Coach Works plant were furnished to Rauch & Lang Inc., a firm organized on Jan 6, 1920 to take the assets of the electric automobile department of the Baker, Rauch & Lang Co. of Cleveland, Ohio. 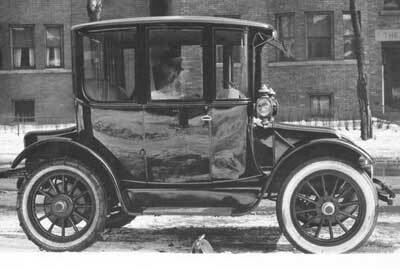 Its operations were relocated to Chicopee Falls, Massachusetts, where the firm manufactured electric taxicabs in a portion of the J. Stevens Arms & Tool Company. Rauch & Lang Inc.’s officers included: H. W. Steiner, Pres. ; F. H. T. Potter, Treas. ; N. H. Richards, Sec., its directors: H. W. Steiner, Chrm. of Board, Springfield, Mass. ; P. A. Frank, Longmeadow, Mass. ; R. L. Jones, Boston, Mass. and F. H. T. Potter, Chicago, Illinois. “Difficulties That Arose from Changing to Taxicab Field Being Smoothed Out. “Chicopee Falls, Mass., April 15 — H. W. Steiner, president and general manager of Rauch & Lang, Inc., whose plant has been offered for sale by the city of Chicopee for taxes, said today that an extension of time has been granted until May 1, and that arrangements would be effected by which the company’s production of gasoline and electric taxicabs would go forward uninterruptedly. “The schedule, he says, calls for successive increases of production between now and September to fill orders already in hand. Twenty gasoline cabs a month are now being made, he said, which gradually will be raised to fifty. Production of electric cabs is said to be about six a month. Large outlays and various difficulties incidental to entering the taxicab field cramped the concern temporarily, he states, but most of the difficulties have been smoothed out, and orders and prospects warrant an optimistic view of the future. “A portion of the Rauch & Lang plant was leased some months ago to Stevens-Duryea Motors Inc., and the two concerns are carrying their production on independently under the same roof. The old Stevens-Duryea plant is in use for storage. At the recent annual meeting of Rauch & Lang, Inc., Mr. Steiner was chosen president and Frank H. Potter of Chicago, treasurer. The Hendee Manufacturing Company was re-named/reorganized as the Indian Motocycle Manufacturing Company in 1928. Premont, Alphonse U.; Springfield Upholstering and Awning Co., 33 Dwight. Premont, George P.; Springfield Upholstering and Awning Co., 33 Dwight. Premont, Hugh D.; Springfield Upholstering and Awning Co., 33 Dwight. Springfield Coach Works' Springfield plant was eventually raised to make way for the construction of the Springfield Civic Center in 1971-72. The facility was extensively remodeled in 2006 and re-christened the Massachusetts Mutual Center.